Meet Today’s Rescuer: Abby from Washington DC! 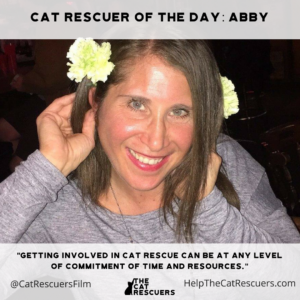 Abby has worked with Humane Rescue Alliance, City Dogs Rescue & Kitties, Animal Welfare League of Arlington, and Lost Dog & Cat Rescue. Mostly I focus on kittens. For the last three years I have been an active kitten foster through several DC based organizations, primarily through the Humane Rescue Alliance (HRA). In addition to fostering with HRA I also volunteer to work with other fosters with kittens they are fostering – answering questions and trying to triage non-medical issues. I also do quite a bit of foster work with shy or semi-feral kittens up to six months of age, working with them to socialize them so they can be adopted! There are so many special stories! Since I work with kittens, sometimes they come into the shelter with such a sad story, left behind at such a young age and completely unable to care for themselves. Singleton kittens can be one of the most rewarding kitten experiences. If you are lucky, they get paired with at least one other kitten when they are sent into foster. Once, I took in a mom and her three babies and a singleton kitten named Adelphi. Adelphi was tiny (under one lb) and all on his own. The mom ended up rejecting her babies once we got everyone into my home, so I ended up having to bottle feed the babies, but Adelphi took over the rest. He taught those kittens how to play, how to eat, how to use the litter box, and most of all how to love. From the moment he was paired with those babies (which was five minutes before they were put in the carrier to go in my car) he loved on them and was so happy to have found playmates. He was always cleaning everyone and snuggling with them. He ended up going to his forever home with one of the others and they are still snuggle buddies today. Getting involved in cat rescue can be at any level of commitment of time and resources. You do not have quit your job to do it or sell you home to pay for it! If you cannot take cats into your home to foster, there are so many other ways to help shelters and rescue organizations in your community. For me, getting involved in fostering brought a fulfillment into my life that I did not know was possible. I am eternally grateful to those that I work with. Cat rescue does not mean you will end up owning lots of cats! To give the gift of helping an animal in need find a better life is in fact a gift to yourself! I love to travel and be outdoors. I know it will shed light on an area where we need more help and inspire more people to get involved. Go follow Abby on Instagram (@catsandfritatas). And be sure to follow @CatRescuersFilm on Facebook, Twitter and Instagram!